Freckles is an absolute doll who is always looking for a belly rub. She doesn't know a stranger, and is quick to dole out kisses. Freckles is 17" / 35 lbs. AKC Registered. Blue Buckaroo Aussies is so excited to have SIG as a part of our program. He brings awesome bone, structure and temperament to the table. He is our stellar little man in a small package - only 15" tall. He has a wonderful temperament, great build and great expression - all backed by over 10 generations of proven healthy and versatile Aussies. SIG is 15" and 25 lbs. AKC Registered. Reserved - Thank you Trevor! Reserved - Thank you Emily and Ross! Darling little tri girl. Gorgeous girl. 25-30 lbs at maturity. Brown eyes. Willow loves to carry toys around - she is such a character - keeps me laughing all the time! Reserved - Thank you Ron! Quite unique little boy - we don't often have dilute colors. 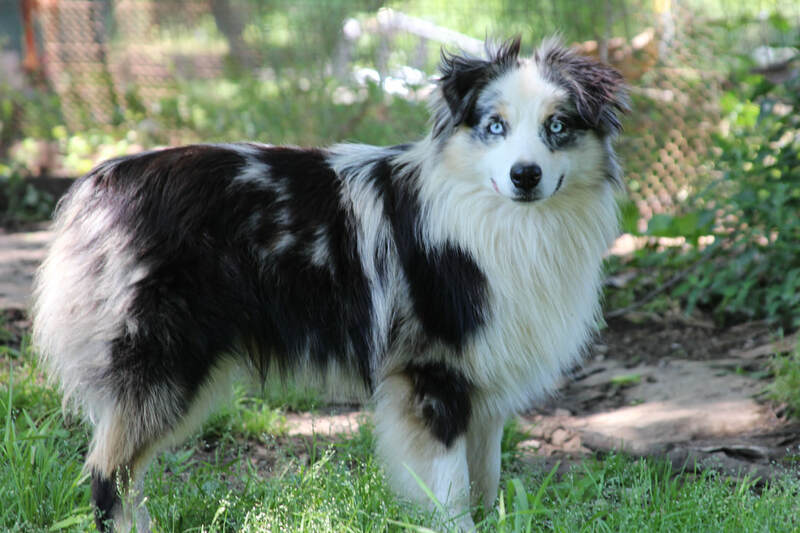 Although the color is not technically breed standard, it is gorgeous as all get out. 25- 30 lbs at maturity. Brown eyes.